Fertilizers are chemical substances that are used to enrich soils with specific nutrients to help plants grow. The elements provided by fertilizers are typically nitrogen, phosphorus and potassium, although other elements such as calcium and sulfur are also available within certain commercial fertilizers. When applied to the soil, fertilizers break down into these constituent components and are then absorbed through the root systems of plants as a form of nourishment. Fertilizers provide nutrients to the soil to help plants grow. Urea is the most widely used solid nitrogen fertilizer and is usually applied as granules, although it is sometimes mixed with ammonium nitrate and dissolved in water to form urea ammonium nitrate solution. When applied to soil, urea reacts with water to form ammonia, which makes the nitrogen within the fertilizer available to plants. Urea fertilizers deliver one of the highest amounts of nitrogen at 46 percent, with no phosphorus or potassium. A solid fertilizer typically applied in granular form, ammonium nitrate provides substantial amounts of nitrogen to the soil. The Fertilizer Institute indicates that ammonium nitrate is particularly effective at fertilizing specialty crops such as citrus and pasture lands. Ammonium nitrate typically provides 33 percent nitrogen. A by-product derived from the waste generated by coke ovens, ammonium sulfate forms when sulfuric acid is used to remove ammonia from the coal used to make coke. Ammonium sulfate is a solid material that contains 21 percent nitrogen. This fertilizer contains 16 percent nitrogen in a nitrate form. Less effective than other nitrogen fertilizers due to leaching when applied to soil, calcium nitrate is often used in fruit and vegetable crops to provide a readily available source of nitrogen and also provides soluble calcium for soils that are calcium deficient. Where soils do not have enough phosphorus, diammonium phosphate can provide significant amounts of this chemical, at around 46 percent. The ammonia component of diammonium phosphate also delivers around 18 percent nitrogen. Highly water soluble, diammonium phosphate is often applied in liquid form. Another phosphorus fertilizer, monoammonium phosphate delivers even more phosphorus than diammonium phosphate, at 48 percent. 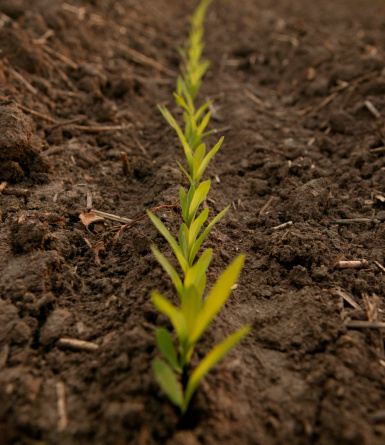 The amount of nitrogen in fertilizer provides is somewhat less at 11 percent. The lower level of the ammonia component of this chemical lessens the risk of damage when applied to new seedling growth. Available in granular form, triple super phosphate is applied directly to the soil. While largely replaced by diammonium phosphate and monoammonium phosphate due to better storage and the availability of nitrogen within the chemicals, triple super phosphate is still in use both commercially and in home applications. Triple super phosphate is often combined with nitrogen-based fertilizers to provide a better, broad-spectrum application. Potassium nitrate, also called nitrate of potash, is frequently used on vegetable crops including celery, potatoes, leafy green vegetables, tomatoes and several fruit crops, according to the Michigan State University Extension. The nitrate component of this chemical fertilizer works well with these crops. Potassium nitrate provides 44 percent potassium. Sometimes called muriate of potash, potassium chloride is a significant source of the element potassium as a fertilizer. Directly applied to soils or combined into multiple endings of mixed fertilizers, potassium chloride is also highly soluble and can be applied in liquid fertilizers. The chemical typically provides 60 to 62 percent potassium. Which Is the Best Fertilizer for Pecan Trees?